Was Apple's U2 Giveaway Creepy or Smart? 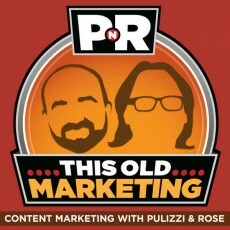 This Week in Content Marketing: Was Apple’s U2 Giveaway Creepy or Smart? In this episode, Robert and I debate whether Apple’s decision to give away 500 million copies of U2’s new album was a brilliant content marketing coup or a creepy cautionary tale. We marvel at the growing number of software solutions for content marketers, and explore the growing gap between ad agencies and client needs. Rants and raves include a brilliant response to an online advertising critic’s rant about its shortcomings, an amazing example of storytelling as advertising by a nonprofit, and a smart viewpoint on how Content Marketing World can evolve to help break down silos within organizations. Our #This Old Marketing example of the week focuses on AllRecipes.com. Apple Launches the iPhone 6… and a Watch… and a U2 Album Controversy (7:26): As part of Apple’s launch of the iPhone 6 and Apple Watch last week, the company gave away 500 million free downloads of U2’s new album, Songs of Innocence. Three days after the release, Interscope Records said the release was “the biggest album launch ever,” according to The Loop website. Music industry publication Spin reports Apple paid over $100 million for the rights to hawk the new album. Yet, another article from Business2Community points out that the way in which this new album was auto-downloaded to the accounts of all iTunes users “bordered on the creepy.” Was this smart content marketing or a desperate move by Apple and U2? Robert and I debate the pros and cons. Content Marketing Software Shakeout (18:45): The Altimeter Group recently published a SlideShare presentation on how to select content marketing software. It’s paired with an article by Convince & Convert’s Jay Baer that suggests a shakeout of content marketing software vendors is coming soon. Robert and I agree that there’s a blurring of the lines between content marketing, marketing automation, ad technology solutions, and other software that can help facilitate content marketing, which creates challenges for marketers and vendors alike. We speculate on the evolution that’s likely to take place in the next 12 to 24 months. Time for Advertising Agencies to Shake It Up or Die Out (32:21): An opinion piece on The Guardian website by agency exec Tom Goodwin suggests there’s a growing gap between clients’ needs and the services ad agencies provide to them. He says agencies are so busy being tactical, that no one is shaking things up any more. Robert explains how to build support for a content marketing initiative and escape the campaign mentality, while I discuss two of the primary differentiators that make content initiatives successful. This week,This Old Marketing is being sponsored by Emma — email marketing for the modern brand, featuring mobile-responsive templates, social integration tools and concierge services. 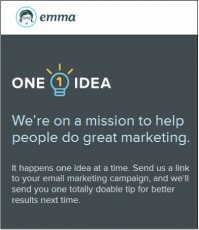 Emma is promoting a new service called One Great Idea. Send them a link to your email marketing campaign, and they’ll send you one totally doable tip for better results next time. You can register for it at http://bitly.com/pnr-idea. Robert’s Rave: Mark Ramsey takes “ad contrarian” and NAB keynoter Bob Hoffman to task for his recent profanity-laced critique of online advertising. Hoffman claims its proponents have exaggerated its effectiveness, and complains that advertisers are wasting millions of dollars on it; yet, Ramsey cites authoritative statistics that refute each of Hoffman’s points. Robert loves this article so much, he wishes he had written it himself. Robert’s Rave: Robert shares the reasons why he is such a fan of a Stand Up to Cancer video from the UK, entitled It’s Payback Time, which he has proclaimed to be “the epitome of storytelling as advertising” and “one of the most brilliant ads I’ve seen for a nonprofit effort — ever.” Watch it! Joe’s Rave: Two days after the close of Content Marketing World, Marcus Sheridan wrote a thoughtful post entitled, Content Marketing’s Biggest Problem and What Can Be Done About It. In it, he points out that more salespeople need to attend CMW to better understand how to use content to communicate with their customers. Robert and I agree with this assessment, but strongly believe other functional areas ought to be educated as well. There needs to be a new relationship between marketing and sales, and we talk about what that should look like. AllRecipes.com: This 16-year-old cooking recipe site has parlayed its online success into a very successful print magazine of the same name. According to this article on PubExec.com, AllRecipes.com’s magazine has experienced dramatic growth, jumping from an initial rate base of 500,000 to over 900,000 in its upcoming October issue. It is leveraging its huge trove of online consumer behavior data to identify the most popular content, which it presents in the magazine in ways that only print can. It’s also doing a great job of using this print vehicle to drive readers back to its vibrant online community. Robert and I find the synergies between online and print in this content marketing example to be quite impressive!